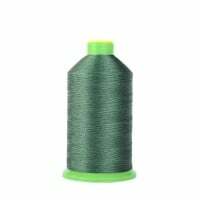 Typical GC20606 Twin Needle Walking Foot Needle Feed Straight Stitch Industrial Sewing Machine. 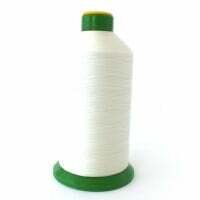 Suitable for upholstery, leather saddles, light to heavy work, bouncy castles, belts, shoes, straps, bags, etc. With the adoption of a new rectangular feed mechanism, an alternating vertical movement mechanism, and a unison-feed mechanism, the machine can feed heavy materials powerfully and smoothly. Well tensed seams are consistently produced without pitch errors. 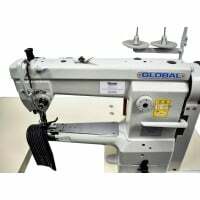 The sewing machine Typical GC20606 is of a robust construction for industrial heavy duty use and has a push down reverse lever and a rotary stitch length adjuster. 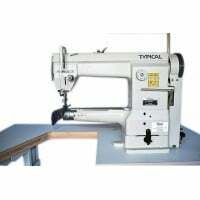 Tags: Typical GC20606, Industrial Sewing Machine.